Leukemia is a cancer that starts in the organs that make blood, namely the bone marrow and the lymph system. Depending on specific characteristics, leukemia can be divided into two broad types: acute and chronic. Acute leukemias are the rapidly progressing leukemias, while the chronic leukemias progress more slowly. The vast majority of childhood leukemias are of the acute form. The cells that make up blood are produced in the bone marrow and the lymph system. The bone marrow is the spongy tissue found in the large bones of the body. The lymph system includes the spleen (an organ in the upper abdomen), the thymus (a small organ beneath the breastbone), and the tonsils (an organ in the throat). In addition, the lymph vessels (tiny tubes that branch like blood vessels into all parts of the body) and lymph nodes (pea-shaped organs that are found along the network of lymph vessels) are also parts of the lymph system. The lymph is a milky fluid that contains cells. Clusters of lymph nodes are found in the neck, underarm, pelvis, abdomen, and chest. The cells found in the blood are the red blood cells (RBCs), which carry oxygen and other materials to all tissues of the body; white blood cells (WBCs) that fight infection; and platelets, which play a part in the clotting of the blood. The white blood cells can be further subdivided into three main types: granulocytes, monocytes, and lymphocytes. The granulocytes, as their name suggests, have particles (granules) inside them. These granules contain special proteins (enzymes) and several other substances that can break down chemicals and destroy microorganisms, such as bacteria. Monocytes are the second type of white blood cell. They are also important in defending the body against pathogens. The B cells protect the body by making “antibodies.” Antibodies are proteins that can attach to the surfaces of bacteria and viruses. This “attachment” sends signals to many other cell types to come and destroy the antibody-coated organism. The T cells protect the body against viruses. When a virus enters a cell, it produces certain proteins that are projected onto the surface of the infected cell. The T cells recognize these proteins and make certain chemicals that are capable of destroying the virus-infected cells. In addition, the T cells can destroy some types of cancer cells. The bone marrow makes stem cells, which are the precursors of the different blood cells. These stem cells mature through stages into either RBCs, WBCs, or platelets. In chronic leukemias, the cancer starts in the blood cells made in the bone marrow. The cells mature and only a few remain as immature cells. However, even though the cells mature and appear normal, they do not function as normal cells. Depending on the type of white blood cell that is involved, chronic leukemia can be classified as chronic lymphocytic leukemia or chronic myelogenous leukemia. Chronic leukemias develop very gradually. The abnormal lymphocytes multiply slowly, but in a poorly regulated manner. They live much longer and thus their numbers build up in the body. 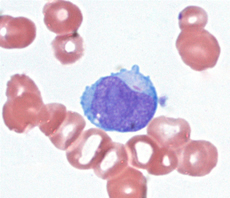 The two types of chronic leukemias can be easily distinguished under the microscope. Chronic lymphocytic leukemia (CLL) involves the T or B lymphocytes. B cell abnormalities are more common than T cell abnormalities. T cells are affected in only 5% of the patients. The T and B lymphocytes can be differentiated from the other types of white blood cells based on their size and by the absence of granules inside them. In chronic myelogenous leukemia (CML), the cells that are affected are the granulocytes. Chronic lymphocytic leukemia (CLL) often shows no early symptoms and may remain undetected for a long time. Chronic myelogenous leukemia (CML), on the other hand, may progress to a more acute form. In acute leukemia, the maturation process of the white blood cells is interrupted. The immature cells (or “blasts”) proliferate rapidly and begin to accumulate in various organs and tissues, thereby affecting their normal function. This uncontrolled proliferation of the immature cells in the bone marrow affects the production of the normal red blood cells and platelets as well. Acute leukemias are of two types: acute lymphocytic leukemia and acute myelogenous leukemia. Different types of white blood cells are involved in the two leukemias. In acute lymphocytic leukemia (ALL), the T or B lymphocytes become cancerous. The B cell leukemias are more common than T cell leukemias. Acute myelogenous leukemia, also known as acute nonlymphocytic leukemia (ANLL), is a cancer of the monocytes and/or granulocytes. Leukemias account for 2% of all cancers. 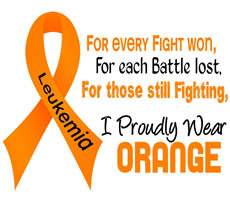 Because leukemia is the most common form of childhood cancer, it is often regarded as a disease of childhood. However, leukemias affect nine times as many adults as children. Half of the cases occur in people who are 60 years of age or older. The incidence of acute and chronic leukemias is about the same. According to the estimates of the American Cancer Society (ACS), approximately 29,000 new cases of leukemia were diagnosed in 1998. Internationally, leukemia is the fourth most common cancer among people age 15 to 19 years old. Leukemia strikes both sexes and all ages and its cause is mostly unknown. However, chronic leukemia has been linked to genetic abnormalities and environmental factors. For example, exposure to ionizing radiation and to certain organic chemicals, such as benzene, is believed to increase the risk for getting leukemia. A 2003 study from the Electric Power Research Institute showed possible links between metallic drainpipes and childhood baths. Chronic leukemia occurs in some people who are infected with two human retroviruses (HTLV-I and HTLV-II). An abnormal chromosome known as the Philadelphia chromosome is seen in 90% of those with CML. The incidence of chronic leukemia is slightly higher among men than women. Acute lymphoid leukemia (ALL) is more common among Caucasians than among African-Americans, while acute myeloid leukemia (AML) affects both races equally. The incidence of acute leukemia is slightly higher among men than women. People of Jewish ancestry have a higher likelihood of getting leukemia. A higher incidence of leukemia has also been observed among persons with Down syndrome and some other genetic abnormalities. A history of diseases that damage the bone marrow, such as aplastic anemia, or a history of cancers of the lymphatic system puts people at a high risk for developing acute leukemias. Similarly, the use of anticancer medications, immunosuppressants, and the antibiotic chloramphenicol also are considered risk factors for developing acute leukemias. Like all cancers, leukemias are best treated when found early. There are no screening tests available. If the doctor has reason to suspect leukemia, he or she will conduct a thorough physical examination to look for enlarged lymph nodes in the neck, underarm, and pelvic region. Swollen gums, enlarged liver or spleen, bruises, or pinpoint red rashes all over the body are some of the signs of leukemia. Urine and blood tests may be ordered to check for microscopic amounts of blood in the urine and to obtain a complete differential blood count. This count will give the numbers and percentages of the different cells found in the blood. 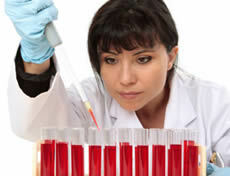 An abnormal blood test might suggest leukemia, however, the diagnosis has to be confirmed by more specific tests. A doctor may perform a bone marrow biopsy to confirm the diagnosis of leukemia. During the biopsy, a cylindrical piece of bone and marrow is removed, generally from the hip bone. These samples are sent to the laboratory for examination. In addition to diagnosis, the biopsy is also repeated during the treatment phase of the disease to see if the leukemia is responding to therapy. Standard imaging tests, such as x rays, computed tomography scans (CT scans), and magnetic resonance imaging (MRI) may be used to check whether the leukemic cells have invaded other areas of the body, such as the bones, chest, kidneys, abdomen, or brain. A gallium scan or bone scan is a test in which a radioactive chemical is injected into the body. This chemical accumulates in the areas of cancer or infection, allowing them to be viewed with a special camera. Alternative therapies should be used only as complementary to conventional treatment, not to replace it. Before participating in any alternative treatment programs, patients should consult their doctors concerning the appropriateness and the role of such programs in the overall cancer treatment plan. Appropriate alternative treatments can help prolong a patient’s life or at least improve quality of life, prevent recurrence of tumors or prolong the remission period, and reduce adverse reactions to chemotherapy and radiation. The effectiveness of most anti-cancer drugs used to treat leukemia can be reduced when patients take mega doses of antioxidants. These antioxidants, in patients not undergoing chemotherapy, can be very helpful in protecting the body against cancer. However, taken during chemotherapy, these antioxidants protect the cancer cells from being killed by treatment. Because high-dose supplementation of antioxidants can interfere with conventional chemotherapy treatment, patients should only take them at dosages much above the recommended daily allowance (RDA). Avoiding fatty and spicy foods, which may be harder to digest. Increasing consumption of fresh fruits and vegetables. They are nature’s best sources of antioxidants, as well as vitamins and minerals. Eating multiple (five or six) meals per day. Small meals are easier to digest. Establishing regular eating times and not eating around bedtime. Avoiding foods that contain preservatives or artificial coloring. Monitoring weight and eating adequate calories and protein. Vitamins and minerals. Vitamins that are of particular benefit to cancer patients include beta-carotene, B-complex vitamins, (especially vitamin B6, vitamin A, C, D, E and K. The most important minerals are calcium, chromium, copper, iodine, molybdenum, germanium, selenium, tellurium, and zinc. Many of these vitamins and minerals are strong antioxidants. However, patients should not take mega doses of these supplements without first consulting their doctor. Significant adverse or toxic effects may occur at high dosage, which is especially true for minerals. It is prudent to avoid use of antioxidants when undergoing chemotherapy or radiation therapy since these treatments kill the cancer by producing oxidants. Antioxidants can undermine the effectiveness of treatment. Other nutritional supplements that may help fight cancer and support the body include essential fatty acids (fish or flaxseed oil), flavonoids, pancreatic enzymes (to help digest foods), hormones such as DHEA, melatonin or phytoestrogens, rice bran, and mushroom extracts. It is best to check with a nutritional physician or other licensed provider when adding these supplements. Conventional treatment for leukemia is associated with significant side effects. These adverse effects can be reduced with Chinese herbal preparations. Patients should consult an experienced herbalist who will prescribe remedies to treat specific symptoms that are caused by conventional cancer treatments. There is conflicting evidence regarding the effectiveness of homeopathy in cancer treatment. Because cancer chemotherapy may suppress the body’s response to homeopathic treatment, homeopathy may not be effective during chemotherapy. Therefore, patients should wait until after chemotherapy to try this relatively safe alternative treatment. Acupuncture is the use of needles on the body to stimulate or direct the meridians (channels) of energy flow in the body. Acupuncture has not been shown to have any anticancer effects. However, it is an effective treatment for nausea, a common side effect of chemotherapy and radiation. Other therapies that may help the leukemia patient include meditation, qigong, yoga, and t’ai chi, all of which can aid in stress reduction. Guided imagery can increase immune function and decrease pain and nausea. There are two phases of treatment for leukemia. The first phase is called induction therapy. The main aim of the treatment is to reduce the number of leukemic cells as far as possible and induce a remission in the patient. Once the patient shows no obvious signs of leukemia (no leukemic cells are detected in blood tests and bone marrow biopsies), the patient is said to be in remission. The second phase of treatment is then initiated. This is called continuation or maintenance therapy; the aim in this case is to kill any remaining cells and to maintain remission for as long as possible. Chemotherapy is the use of drugs to kill cancer cells. It is usually the treatment of choice and is used to relieve symptoms and achieve long-term remission of the disease. Generally, combination chemotherapy, in which multiple drugs are used, is more efficient than using a single drug for treatment. In 2002, scientists announced the discovery of a gene that triggers the death of leukemia cells. Identification of this gene can lead to better targeting of chemotherapy drugs (that involve a vitamin A derivative) for acute promyelocytic leukemia (APL). Another advancement in leukemia treatment occurred in the same year. A new drug was found to cancel the effects of mutations of a gene known as the main culprit in AML, an aggressive, treatment-resistant form of leukemia. Further study was needed on both new discoveries, but they were thought important to improving treatment of two forms of leukemia. Later in 2002, Gleevec, a new antileukemia drug that even proved successful at treating chronic myeloid leukemia, was heralded in clinical trials. Because leukemia cells can spread to all the organs via the blood stream and lymph vessels, surgery is not considered an option for treating leukemias. Radiation therapy, which involves the use of x rays or other high-energy rays to kill cancer cells and shrink tumors, may be used in some cases. For acute leukemias, the source of radiation is usually outside the body (external radiation therapy). If the leukemic cells have spread to the brain, radiation therapy can be given to the brain. Bone marrow transplantation (BMT) is a process in which the patient’s diseased bone marrow is replaced with healthy marrow. There are two methods of bone marrow transplant. In an allogeneic bone marrow transplant, healthy marrow is taken from a donor whose tissue is either the same as or very closely resembles the patient’s tissue. First, the patient’s bone marrow is destroyed with very high doses of chemotherapy and radiation therapy. Healthy marrow from the donor is then given to the patient through a needle in a vein to replace the destroyed marrow. In the second type of bone marrow transplant, called an autologous bone marrow transplant, some of the patient’s own marrow is taken out and treated with a combination of anticancer drugs to kill all abnormal cells. This marrow is then frozen and saved. 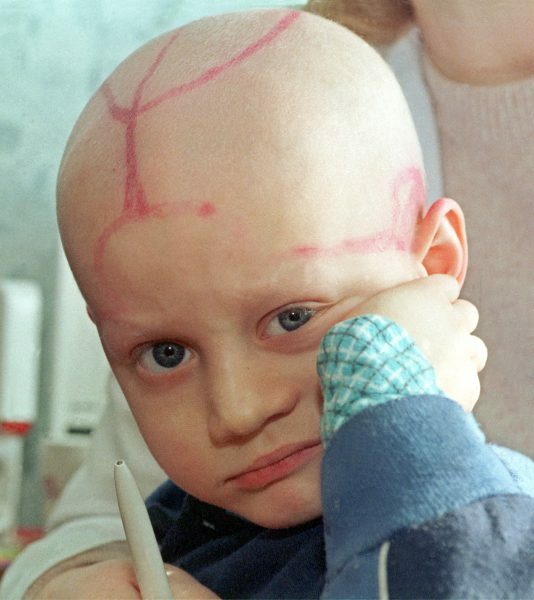 The marrow remaining in the patient’s body is destroyed with high-dose chemotherapy and radiation therapy. The marrow that was frozen is then thawed and given back to the patient through a needle in a vein. This mode of bone marrow transplant is currently being investigated in clinical trials. Biological therapy or immunotherapy is a mode of treatment in which the body’s own immune system is harnessed to fight the cancer. Substances that are routinely made by the immune system (such as growth factors, hormones, and disease-fighting proteins) are either synthetically made in a laboratory or their effectiveness is boosted and they are then put back into the patient’s body. This treatment mode is also being investigated in clinical trials all over the country at major cancer centers. Like all cancers, the prognosis for leukemia depends on the patient’s age and general health. According to statistics, more than 60% of leukemia patients survive for at least one year after diagnosis. Acute myelocytic leukemia (AML) has a poorer prognosis rate than acute lymphocytic leukemias (ALL) and the chronic leukemias. In the last 15 to 20 years, the five-year survival rate for patients with ALL has increased from 38% to 57%. Interestingly enough, since most childhood leukemias are of the ALL type, chemotherapy has been highly successful in their treatment. This is because chemotherapeutic drugs are most effective against actively growing cells. Due to the new combinations of anticancer drugs being used, the survival rates among children with ALL have improved dramatically. Eighty percent of the children diagnosed with ALL now survive five years or more, as compared to 50% in the late 1970s. According to statistics, in chronic lymphoid leukemia, the overall survival for all stages of the disease is nine years. 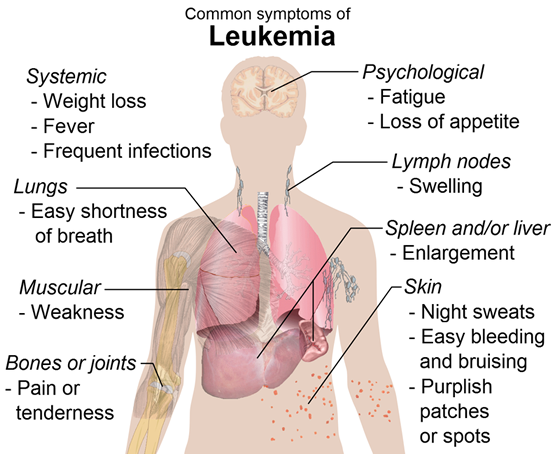 Most of the deaths in people with CLL are due to infections or other illnesses that occur as a result of the leukemia. In CML, if bone marrow transplantation is performed within one to three years of diagnosis, 50-60% of the patients survive three years or more. If the disease progresses to the acute phase, the prognosis is poor. Less than 20% of these patients go into remission. Most cancers can be prevented by changes in lifestyle or diet, which will reduce risk factors. However, in leukemias, there are no such known risk factors. Therefore, at the present time, there are no real prevention recommendations for leukemia. People who are at an increased risk for developing leukemia because of proven exposure to ionizing radiation or exposure to the toxic liquid benzene, and people with Down syndrome, should undergo periodic medical checkups. Some experts recommend limiting toxic exposures, eating a whole foods diet, refraining from smoking, exercise, and fluids, and even intermittent fasting as possible prevention measures. In 2003, new research found that adult women who took aspirin two or more times a week had a 50% lower risk of developing adult leukemia. Scientists continue to work on a possible vaccine for leukemia. They made some progress in 2002, discovering a gene transfer model that might trigger immunity against leukemia cells.